Today is National Grilled Cheese Sandwich Day. We think cheese and bread is one of the greatest pairings in the gastronomic world. Add wine and you’ve got what was called, in the Old World, the Santa Trinità Mediterranea—the Mediterranean Holy Trinity. So, to celebrate, we thought we’d share one of our favorite grilled cheese recipes by food-and-wine expert Janet Fletcher, the creator of Planet Cheese. Her recommendation with these truffley snacks? Sparkling wine or Champagne. Spain’s northeast region of Priorat is an unforgiving place, with sweltering days and cold nights. The vines that grow there are old and gnarled, sprouting from a stony, slate-laced soil called llicorella (“licorice”) for its blackish color. The region was called Priorato (Spanish for “priory”) when a monastery was built there in the Middle Ages, inspired by a villager who had a vision of angels ascending a stairway to heaven. And it does seem miraculous that this infertile region can produce such delicious wines. Priorat’s wines are based primarily on two native red grapes, garnacha (grenache) and cariñena (carignan). Massively structured with considerable tannin, the wines have a soft, thick texture and are usually loaded with ripe blackberry fruit, dense chocolate, lively licorice, and mineral/rock flavors. When phylloxera destroyed most of the vineyards of Europe plus many in the Americas in the late 1800s, Australia was largely spared. One of the lucky legacies is that Australia now possesses many of the oldest vineyards in the world. In the Hunter Valley, for example, the Stevens Vineyard, now owned by Tyrrell’s, includes an “Old Patch” of chardonnay, semillon, and shiraz planted in 1867. Similarly, in the Barossa, the Hewitson family owns the Old Garden Vineyard which contains the world’s oldest mourvèdre, planted in 1853. Also in the Barossa, Penfold’s famous Kalimna “Block 42” of cabernet sauvignon planted in 1888 is thought to be the oldest cabernet sauvignon on the planet. Indeed, although definitive records do not exist, the Old Patch vines are thought to be first generation cuttings from the famous James Busby Collection of vines originally planted at Sydney’s Botanical Gardens in the 1830s—vines that went on to be the source of plant material for vineyards all over the country. The wine region of Alsace looks like it’s right out of a fairytale. There are 119 storybook villages, tucked among over 38,000 acres of vineyards set against the backdrop of the Vosges Mountains. While Alsace is a French wine region today, it has also at various times belonged to Germany. In fact, within a single 75-year period in the nineteenth and twentieth centuries, France and Germany exchanged ownership of the region four times. (Alsace is one of Europe’s strategic geopolitical crossroads). Finally, Alsace is one of the rare wine regions in the world devoted almost exclusively to white wines—the most important being riesling, gewürtztraminer, pinot gris, and muscat. There is a single red variety, though—pinot noir—that grows amidst the idyllic villages. 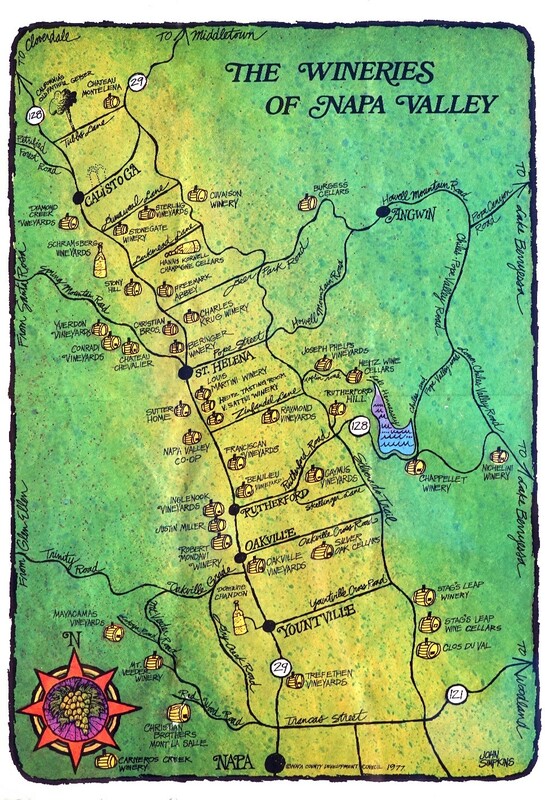 Our friend Steve Burgess of Burgess Cellars sent us this map of Napa Valley in 1971 when it had only 40 wineries. Today (how things have changed) the valley has approximately 475 wineries. As just about everyone knows, Prohibition didn’t deter bootleggers. Just the opposite. The production of spirits soared. Prohibition has also had a modern, unintended consequence. The vintage booze market is now booming. Pre-Prohibition whiskey has become one of the most sought-after spirits for collectors. While bottles of century-old wine can turn to vinegar, whiskey’s flavors are more enduring over time. As long as it remains sealed, whiskey will largely taste the same as when it was bottled. That makes it a safe bet for whiskey lovers who are showing up at auction houses to buy whiskies that were bottled between the turn of the century and the 1920s. Some pre-Prohibition American liquor is selling for close to $20,000 a case, according to Christie’s auction house. And recently a single bottle of 1926 Macallan Scotch (hand-painted by Irish artist Michael Dillon) sold at auction in London for $1.5 million. We hope the buyer plans to drink it straight. Grenache (pronounced gren-AHSH) is well-known both as a white grape (grenache blanc) and a red grape (grenache noir). Grenache is indigenous to Spain, where it is known as garnacha (gar-NA-cha). Like pinot noir, grenache is genetically unstable, making it an extremely difficult grape to grow—and even more challenging to make into wine. From less-than-ideal vineyards, grenache can be heavy-handed, simple, and fairly alcoholic. But, at its best, it has unmistakable purity, richness, and beauty, with the aroma and flavor of cherry preserves. It’s typically blended with other varieties such as carignan, syrah, and mourvèdre to make some truly stunning wines, most notably in France and Spain. The wines of Châteauneuf-du-Pape (France) and the Priorat (Spain) are perfect examples. (And perfect right now in cold winter months). A note of advice from the late Julia Child this holiday season: never cook with a wine that you wouldn’t drink. This is still the golden rule. Wine too poor in quality to drink can actually harm great food flavors. So toss out any red or white table wines that have been hanging around in the back of the fridge. There is, however, one type of wine that can get quite old and still be great in cooking: fortified wine. Madeira, Sherry, and Port (the three leading types of fortified wines) do not spoil quickly. For months after the bottles have been opened, each of these wines will still add a delicious richness to soups, stews, sauces, and roasts.